Cordoba has been on my travel bucket list for ages, and finally, this month, we made it! The reason it has taken so long is that it’s a bit tricky to get to as there are no direct flights, but as we were staying in Malaga for a few days, we decided to go for it. The fast train from Malaga Maria Zambrano takes just an hour, travelling at speeds up to 300km per hour. It cost £98 return for both of us (off peak) via the Renfe website which we bought in advance to save money. The station in Cordoba is around 25 min walk (or ten minutes in a taxi for 7 euros) to get into the old town. We got a taxi in, and walked back to the station via the park which was lovely. So why was it on my wish list? The fabulous cathedral of course, which has over many years existed as both a mosque and the Christian cathedral it is today, where a daily service still takes place, and has done since the reign of Ferdinand and Isabella. Steve was not impressed that we had to queue to get into ‘another church’ but was blown away when he got inside (a bit like he was when I got him in the Blue Mosque in Istanbul). The air in the cathedral is heavy with frankincense (which incidentally contrasts beautifully with the neroli from the orange blossom in the courtyard outside, just coming into bloom). Top tip: if you are visiting in summer, take a cardi as it’s cool inside and you will spend ages in there. The old town is really pretty with lots of inviting tapas bars to try. You can also walk across the bridge to view the walled city from a distance. I’d like to come back and stay for a couple of days next time. 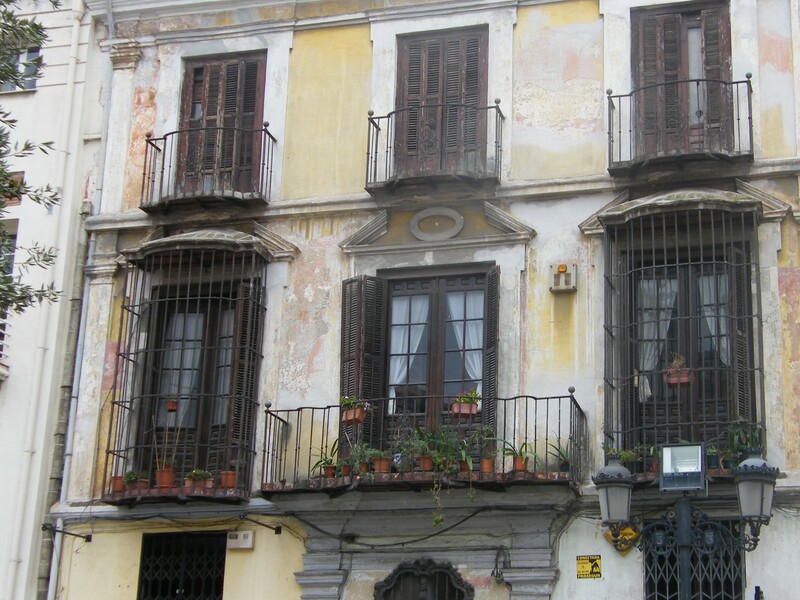 A city break in Malaga is a great way to spend a spring weekend. The weather is just warming up, but the city isn’t too busy, so you have space to walk about and discover the best places to eat and drink. We had just three days to squeeze in as many experiences as possible, starting on our first night with tapas at this little bar which serves only shellfish that you order at the counter and then take over to your table. It’s a bit messy, but good fun! We enjoyed a different type of tapas on our second evening: you just point out the ham you want to try and the owner slices it off for you. We tried Serrano with Manchego cheese. We like to seek out the unassuming bars as that’s usually where you get the best coffee and this one was no exception. We used Malaga as a base for a train journey to Cordoba. More on that later! 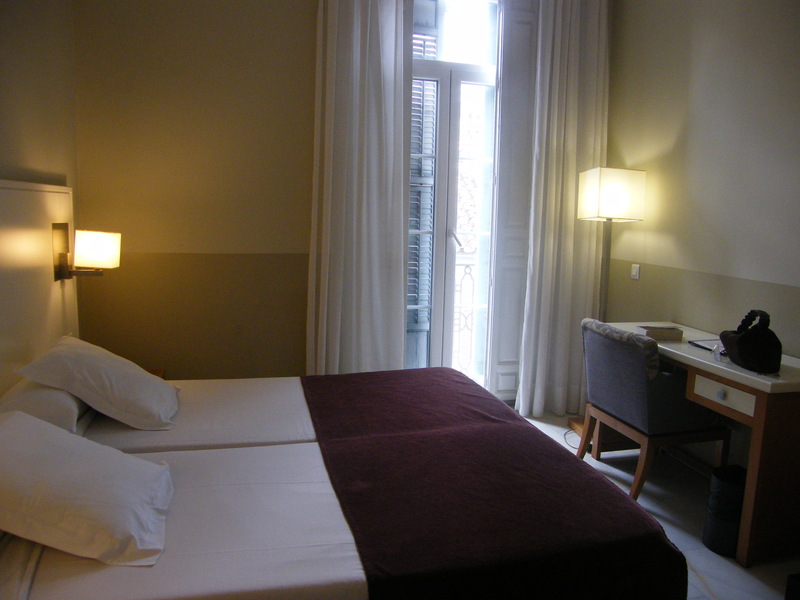 Last weekend we stayed at the tiny Atarazanas Hotel in Malaga city centre which is just five minutes walk from the train station and about the same in the other direction to the main shopping street. It classes itself as a boutique hotel, and to be fair, it has some very on trend pieces of art in the lobby plus tranquil, beautifully decorated rooms. Our bathroom was very chic with its moody dark blue walls. 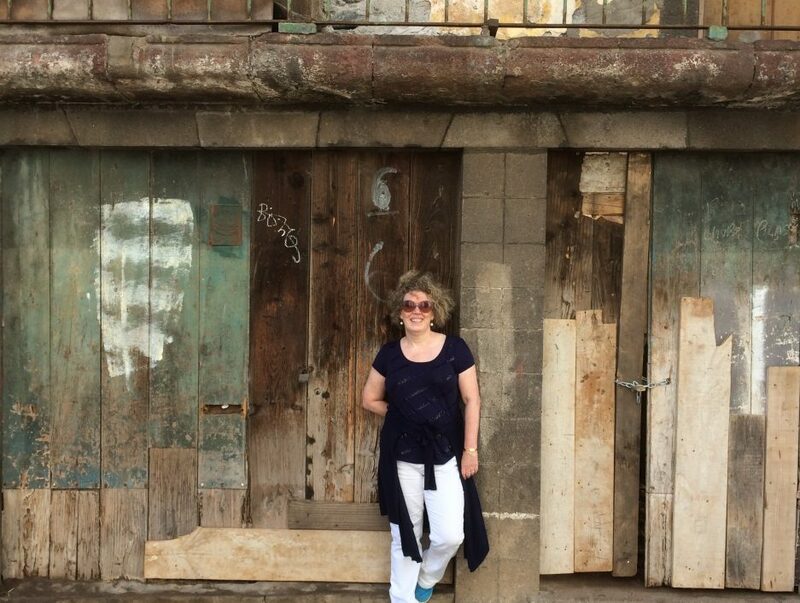 I loved the duck egg blue shutters opening out onto the view of the street below. It’s in an old building, surrounded by beautiful architecture. Directly opposite is the Atarazanas Mercado – a delight for foodies, shoppers and photography enthusiasts. 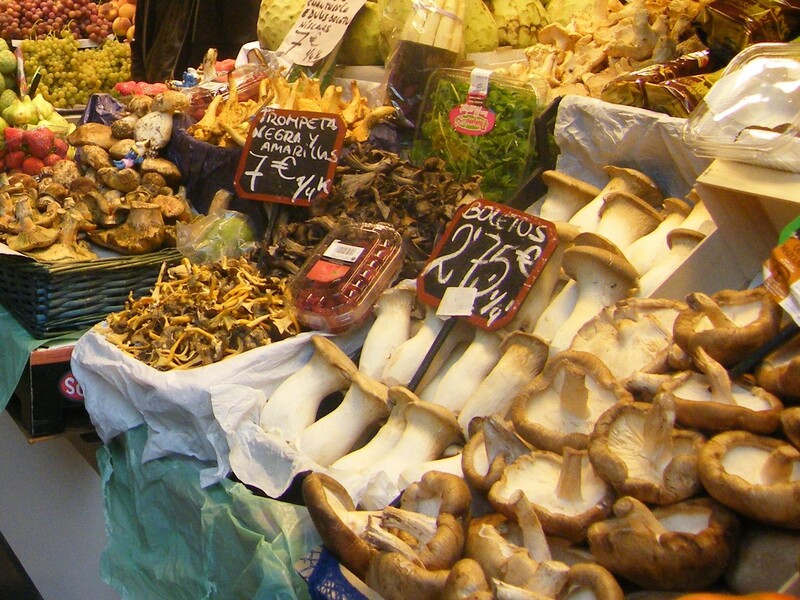 Pictured below is a stall selling all kinds of weird and wonderful mushrooms. The main shopping street is perfect for fashion lovers and I confess to the purchase of shoes and a handbag! I would definitely recommend this hotel for a weekend stay if you want to be right in the heart of the action. 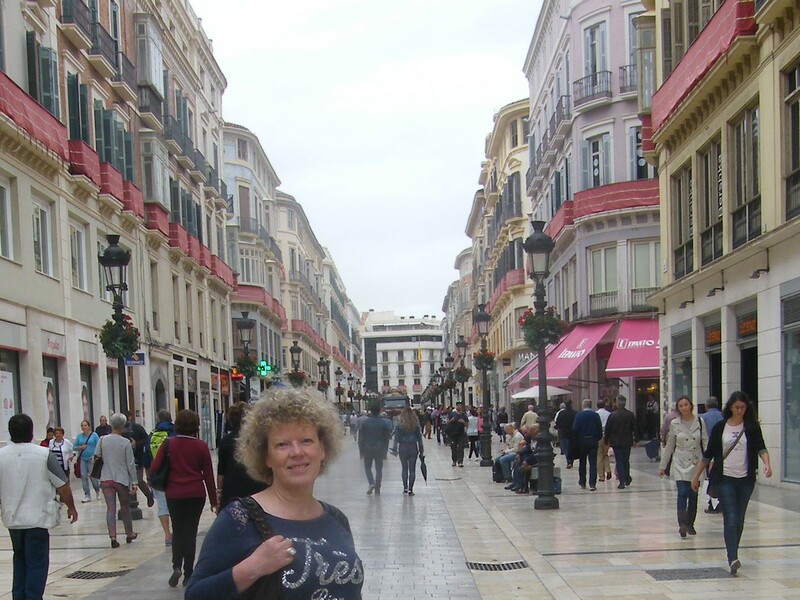 On holiday in Torremolinos last November, we enjoyed a day trip out, taking the train from the central station in Torremolinos town to Zambrano station in Malaga city. Only a 30 minute journey on the efficient Spanish rail network and at around 4 euros each, a bargain. It was a spur of the moment thing, so naturally we didn’t have a map, nor do we have one of those clever phones with sat nav, so we followed the crowd from the station to see where we ended up and of course got lost! After a wasted 30 mins trying to find the town centre, we bought a map (which was incidentally rubbish) and set off for the Alcazaba. The Alcazaba is a Moorish fortress which in its time was a palace, home to a number of rulers. It doesn’t have the fame of the Alhambra in Granada, but it is exquisitely beautiful in its own right. I loved the cool courtyards and Moorish décor. 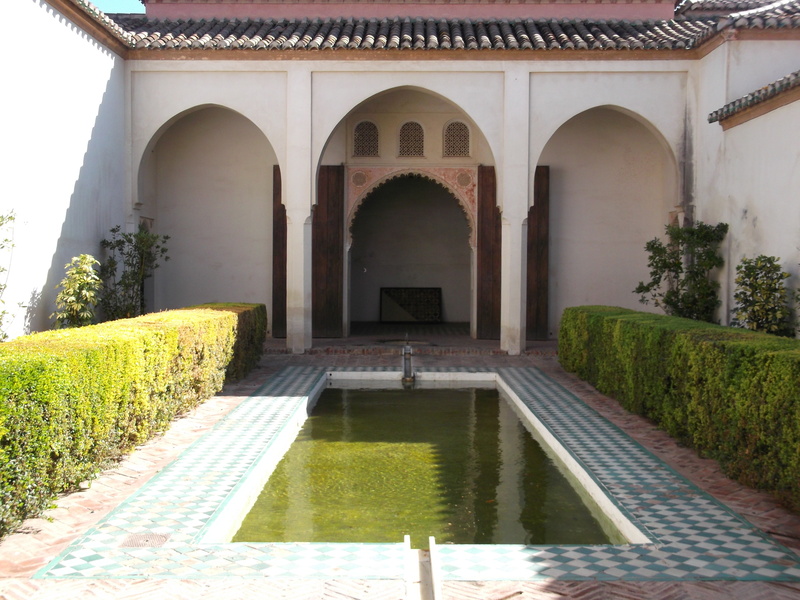 Especially beautiful are the Patio de los Naranjos (courtyard of the orange trees) and Patio de la Alberca (patio of the pool). You can climb up high to get fabulous views of the city and the port. Queen Victoria was docked there that day, and no doubt there is usually a cruise ship to see most days of the week. There is a small admission fee of a couple of Euros and I really do recommend a visit. 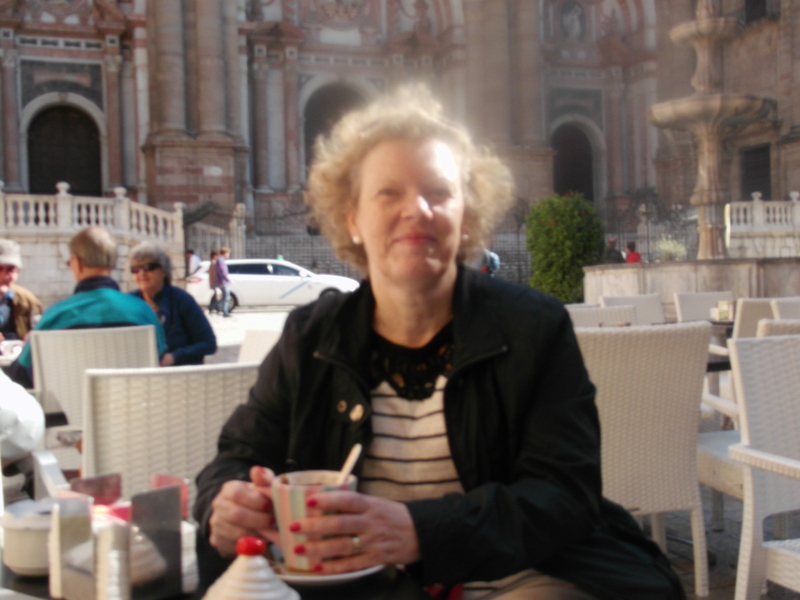 We took refreshment in the square outside Malaga’s central cathedral where I ordered a chocolate caliente, so thick you could stand a spoon in it. Then it was off for a spot of shopping. The central pedestrianized area has the usual Spanish chains that I enjoy a browse in; Zara and Mango plus lots of places selling fashion and jewellery. 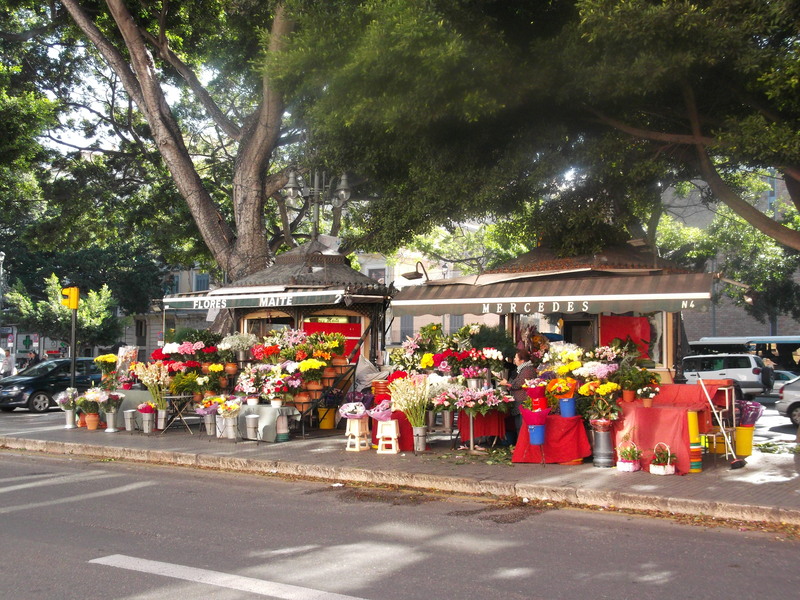 The main thoroughfare reminds me of Las Ramblas in Barcelona with its flower stalls and tabac booths. 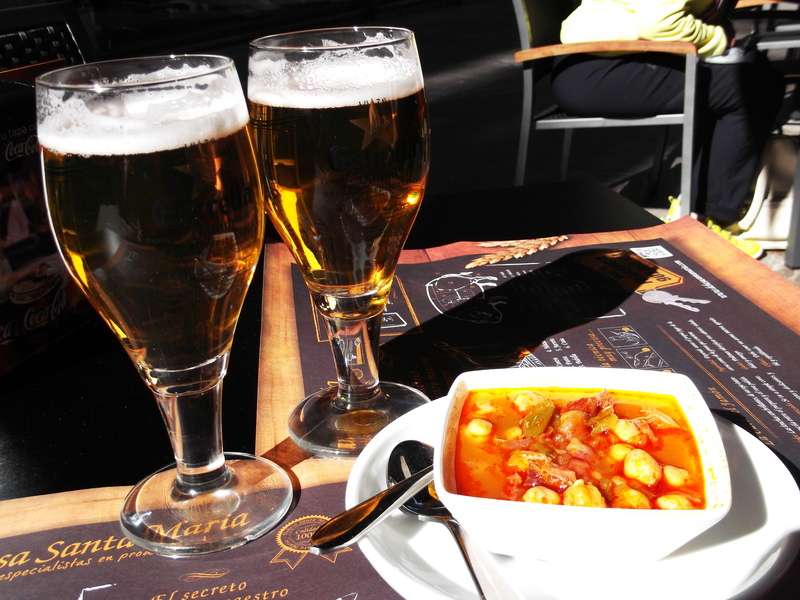 Lunch was a random selection of tapas that we took in the old town. Whilst there we spotted lots of little places we fancied for a future visit and have booked one of them for later in the year so that we can experience the city at night. We found our way back to the station across the Triana bridge which is famous for its padlocks. 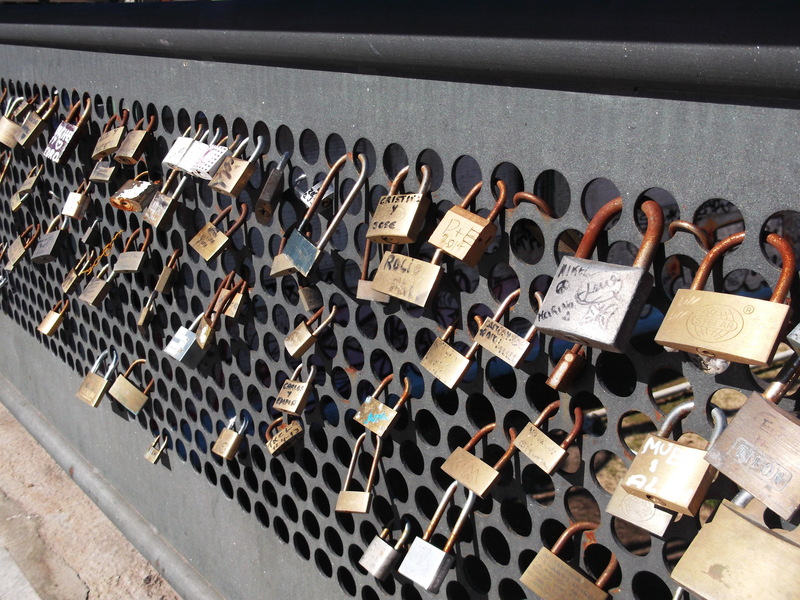 You can swear undying love here by leaving a padlock and throwing the key away. We were really impressed with Malaga and when we come back later in the year, will be able to report on some restaurants and nightlife.